We are bringing you three centuries of wars, waged by the ruthless Vikings. You will quickly be absorbed by the captivating graphic, soundtrack, war cries all of which will bring you on the battlefields. NetEnt maintained their high standards with this fascinating game. The game bravely offers you 243 possible combination of winning, you are sure to have an overwhelming online gaming experience. You can start playing as soon as you have adjusted your bet levels and coin value. A win is triggered whenever you match 3 or more symbols along a payline. You will find your betways could increase all the way up to 78 125 with the Raid spins feature. The Hotspot will also be a gamechanger. Bet Levels: This Slot game by NetEnt offers up to 10 Bet Levels. Easy to adjust; simply use the plus and/or minus buttons found under “Level”. Amount of Paylines Selection: During the main game there are 5-reels, 3-rows and 243 betways. The Raid Spins features will change the game as follows; 7-reel, 5-row and 78 125 betways. Coin Values: To adjust the coin value, simply use the plus and/or minus buttons under the “Coin Value” tab. You can choose between a range of 0.01 up to 0.5. The hotspot will cover the reel 3 during the main game. 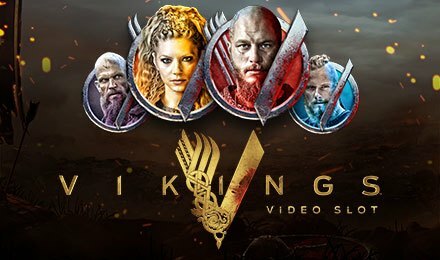 Every time a fully stacked Viking symbol lands on the Hotspot, it will allow all other Viking symbols outside the hotspot to turn into similar Viking symbol that covers the hotspot area. Any of the 4 symbols with a face is a Viking symbol. This feature is activated strictly when similar symbol covers the whole Hotspot area on all 3 reels. The Shield Wall feature shows randomly on the reels during the main game and on the Raid Spins as a group of mystery symbols. The wins will be calculated once they’ve shown up. If during the main game, 3 Raid spin symbols shows on reels 3, 4 and 5, the Raid Spins feature is triggered. Reels will increase to 7 during this feature and rows will go to 5. The betways will also rise to 78, 125. The Hotspot will increase to 3.On the reels 3, 4 and 5, seven Raid Spins are awarded with 3 Hotspots.